How can a specialized cell change its identity? A team from the Institut de Génétique et de Biologie Moléculaire et Cellulaire (CNRS/INSERM/Université de Strasbourg) investigated a 100% effective natural example of this phenomenon, which is called transdifferentiation. This process, by which some cells lose their characteristics and acquire a new identity, could be more generally involved in tissue or organ regeneration in vertebrates, and is a promising research avenue for regenerative medicine. This study identifies the role of epigenetic factors involved in this conversion, underlines the dynamic nature of the process, and shows the key mechanisms for effective transdifferentiation. This work, conducted in collaboration with the Institut Curie1, was published on August 15, 2014 in Science. 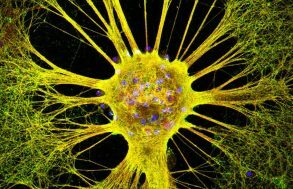 Our body is constituted of cells that acquired characteristics during development and that fulfill a precise function in each organ: we call these differentiated cells. Generally cells maintain their specificity until they die, but it has been proven that some cells can change state and acquire new functions. This is rare but is found in many species and is called “transdifferentiation”. The team studied this process in C. elegans, a small transparent nematode, where a rectal cell transforms naturally into a motor neuron. This change from one cell type into another occurs without cell division, by a succession of well defined steps that always lead to the same result. The researchers investigated the factors that make the conversion process so stable. The team had elucidated the role of several transcription factors2 in this transdifferentiation. But these new results have shown the role of so-called “epigenetic” factors that can modulate gene expression. Two protein complexes are involved in the mechanism. These enzymes act on a histone3 and when a mutation changes their action, the transdifferentiation stops and the rectal cell no longer transforms into a neuron. The researchers observed that the two complexes act at different steps and that their role may change as a function of the transcription factors with which they are associated. These results underline the importance of the correct chain of steps for each of these molecules: the dynamic nature of the transdifferentiation mechanism is essential to its stability. The respective role of genetic and epigenetic factors in biological processes is a hotly debated subject. 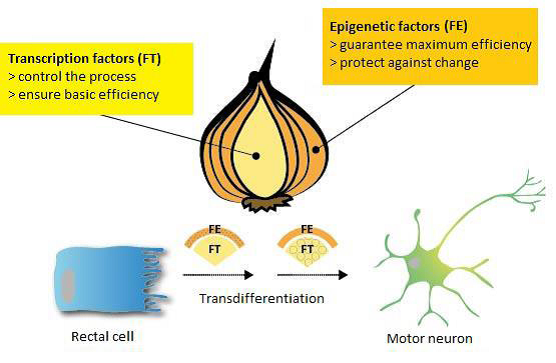 This work shows how each of these factors acts in transdifferentiation: transcription factors handle initiation and progress whereas epigenetic factors guarantee the constant result. The study even goes further, showing that under “normal” conditions, the epigenetic factors are incidental (even when they are absent the conversion occurs relatively efficiently) but that they are indispensable when there are environmental stressors. So they have a crucial role in maximizing the mechanism’s efficacy and ensuring that it remains stable in the face of external variations. Transdifferentiation is a phenomenon that is poorly understood. It may be involved in the organ regeneration that we observe in some organisms, for example newts, which can reconstruct their eye lens after injury. These results bring key new information to help us understand how to control this process and may open the path to promising therapies, in particular in the field of regenerative medicine. We can compare this process to the layers of an onion. Transcription factors are at the heart of process efficiency, while epigenetic factors form the outer layers that protect the mechanism from attacks and environmental change. (3) Protein in the nucleus, around which the DNA rolls. 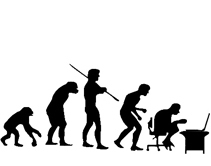 We’re all a bit Neanderthal… or are we? Sequential Histone Modifying Activities Determines the Robustness of Transdifferentiation ; S. Zuryn, A. Ahier, M. Portoso, E. Redhouse White, M.C. Morin, R. Margueron, S. Jarriault ; Science ; 15 août 2014.